Anyone who’s watched a legal or criminal television program or movie is familiar with the Miranda warning. Beginning with “You have the right to remain silent,” it has been an integral part of most scripts in which an arrest is made for years. But simply knowing the beginning phrase doesn’t imply that its importance is fully understood. For a driver in New Jersey who is arrested for DWI, there is a great deal of confusion as to when the Miranda rights will be read and how important they are. 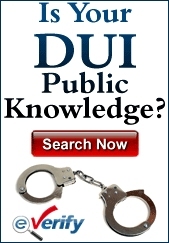 Since DWI is a traffic violation, many believe that the Miranda warning is not necessary. Others think that the Miranda warning must be read regardless of the situation. In reality, a person must be read the Miranda warning when criminal activity is suspected and there is an arrest. If the answers, comments or statements can incriminate them, the Miranda warning must be read by the officer. When a law enforcement officer witnesses or receives reports of a vehicle committing dangerous actions, breaking traffic laws or driving erratically, a DWI stop can be initiated. In order for a DWI arrest to be valid the officer must have a justifiable reason to make the stop. Once the stop is made, the officer will commence with an investigation. This will include interacting with the driver to look for telltale signs of intoxication including glassy eyes, slurred words and the odor of alcohol. After that, field sobriety tests will be given. These will include the Walk and Turn test, the One-Leg Stand test and the Horizontal Gaze Nystagmus test. After that, the breathalyzer test will be given to determine the driver’s blood alcohol content. A driver who is 21 or over who registers a BAC of 0.08% or above will be arrested for DWI. For a commercial driver, the level is 0.04%. For a driver under the age of 21, the level is 0.01%. If there is a conviction for DWI, the penalties can be significant. A first time offense with a BAC of 0.08% and below 0.10% will lead to a driver’s license suspension of three months. There can be jail time of up to 30 days. There will be a fine of between $250 and $400. Annual surcharges will be assessed for three years and cost $1,000 per year. There will be a $230 fee for the Intoxicated Driver Resource Center (IDRC). $100 each will go to the Alcohol Education and Rehabilitation Fund (AERF) and the drunk driving fund. $75 will go to the Neighborhood Services Fund. With subsequent offenses and higher BAC, the penalties are worse. There is frequently a misunderstanding of a driver’s rights when it comes to various issues during a DWI stop. For example, there is a difference between the Miranda rights and the implied consent that a driver automatically has given to submit to a breath test when requested to do so by a law enforcement officer. Drivers mistakenly think that they have the right to protect themselves from self-incrimination by refusing to take a breath test. In truth, this is an offense in and of itself. The officer will read from a prepared statement verbatim asking that the driver agree to take the breath test. This will be read twice and the driver will receive the opportunity to submit to the test. A driver who doesn’t take the test when asked will be charged with refusal. Refusal will be charged whether the driver had been drinking or not and the penalties are much the same as if there was a drunk driving conviction. When it comes to the police stop, the officer is allowed to ask questions and the driver is allowed to politely decline to answer them. As with the implied consent to take a breathalyzer, the driver is required to give documents such as the driver’s license, registration and proof of insurance to the officer when asked. Simple questions such as where the driver is coming from and going are not subject to Miranda warning. 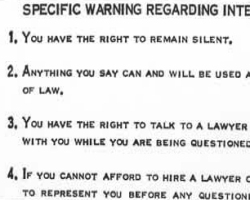 When the arrest is made, the officer will read the Miranda rights. This can be done at the site of the arrest or at the police station. This statement will be given to the defendant in written form. It must be signed and verified that it is understood.